His name is Archon the Wizard and he’s here to help you improve your Diablo 3 playing skills with helpful tutorials and guides. Do you want to build an efficient wizard but you’re kind of on a slim budget? Don’t worry, Archon’s got you covered with his Budget Archon Guide: 1 Million for MP1 video. Want to find out how to farm Demonic Essences? Well, he’s got a video for that too. Being a consistent streamer must be pretty tiring, so must hard to figure out how cook a good meal. Luckily, I’ve devised a simple recipe to fix that problem! I asked Archon what kind of food he enjoys eating and he responded with burritos. 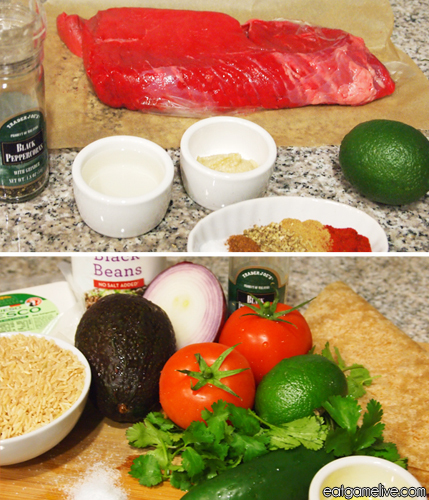 So, I’ve created a very simple carne asada burrito. I present to you Archon’s Crit Mass Burritos! 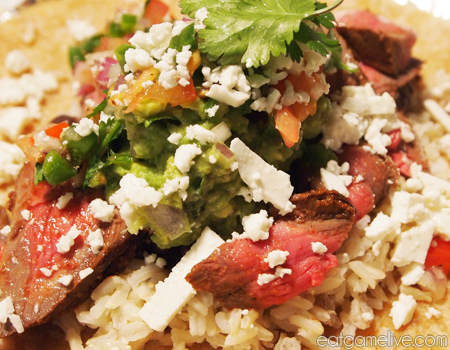 note: Carne Asada must be marinated for at least an hour. Four hours or longer is strongly recommended! Prep time will take about 10 minutes for the beef, and 20 minutes for the condiments. Idle time is 4 to 12 hours. Cook time will be about 40 minutes (mainly due to cooking rice). This recipe makes 4 servings. Place meat in a large dish. 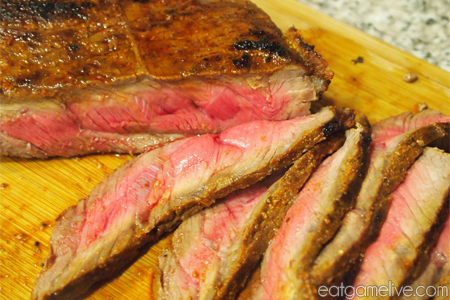 Coat both sides of the meat with lemon juice and white vinegar. Pour salt, pepper, cumin, paprika, cayenne, and oregano over the beef. Gently massage the seasonings into the beef. Cover dish with cling wrap and let the beef marinate for at least 4 hours in the fridge (the longer you let the beef marinate, the better. I marinated the beef over night). Set a pot to boil 2 cups of water. Once the water begins to boil, add your rice and cook for about 35 minutes. During this cooking time, prepare your beef and condiments. Set a skillet on high heat and add your olive oil. Once the skillet becomes hot, place your marinated beef onto the skillet. Sear each side for about 5 minutes. Then, reduce the heat to medium and cook for an additional 7 minutes. Place canned black beans in a pot over medium heat. Heat the beans for about 5 minutes. To prepare pico de gallo, combine diced jalapeño, diced red onion, diced tomatoes, and diced cilantro in a bowl. Season with salt and pepper to taste. To prepare guacamole, place pitted avocado meat in a bowl. Smash avocado with a fork. Season the avocado with salt and pepper, then add lime juice, chopped red onion, and cilantro. Stir to combine. Warm your tortillas by placing each tortilla between damp paper towels. Set the tortillas in the microwave for about 15 seconds. 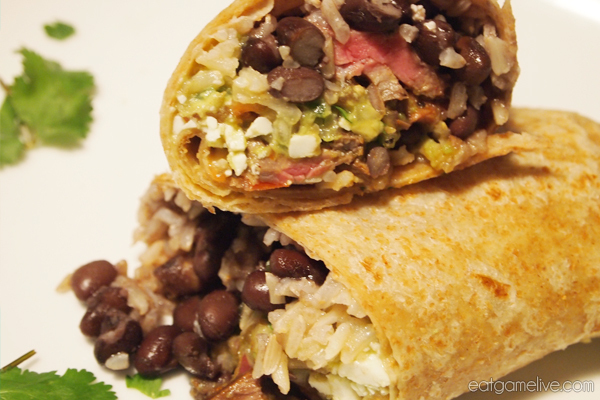 Place rice, meat, pico de gallo, avocado, black beans, and queso fresco on a tortilla and roll the tortilla into a burrito. Now, I will admit my burrito rolling abilities are horrible. My coworkers can vouch for the fact that my burrito rolling skills are not up to par. They’ve actually stared at me while I ate my self-made burrito in the hopes that the structural integrity of the burrito would collapse, resulting in a catastrophic burrito-related incident. Luckily, that didn’t happen. I’m going to assume that you’re a much better burrito roller than I am, so your burritos will look far more appetizing. Regardless, these Crit Mass burritos were delicious, so a GG WP for all! These burritos were made in honor of Archon; he’s a great streamer and all around great guy, so I highly recommend that you check out his TwitchTV stream. If you watch his stream consistently, you will earn Arcoins that you can use for participating in raffles, giveaways, gear checks, and even Deal or No Deal! Happy Legendary and Demonic Essence farming!